The Track Family Fun Parks is a fantastic Branson attraction which provide the fastest way to enjoy a great time together with the whole family. Coming to this family’s one stop fun shop, gives you the opportunity to enjoy great fun rides with high-rise and classic go-kart tracks, laser tag, laser maze challenge, bumper boats/cars, mini golf, kids’ ride, indoor glow golf, arcades and more – all these with no gate admission charge. Having provided great family entertainment in Branson for over 30 years, the Track Family Fun Parks have 14 different go-kart tracks that give riders unlimited options to enjoy thrilling rides for every age level. The iconic Navy Pier Ferris Wheel that was launched only this year 2016 will find a new home at Track 4. Standing 150 feet tall, it has 40 gondolas capable of holding 240 riders, and the night is lit up with about 16,000 LED lights. Now named The Branson Ferris Wheel, it boasts spectacular views of the famed entertainment hub of Branson and the picturesque Ozark Mountains. This new Ferris Wheel in Branson was inspired by the original steel observation wheel designed by George Ferris, Jr. for the 1893 World’s Columbian Exposition in Chicago. At the Track Family Fun Parks, you can have the chance to enjoy the new blacklight and laser attractions at Track 5 – Route 76 Glow Golf, a custom-designed 9-hole, black light mini golf course that features many of the mainstay sights in the area. If you want to participate with the Lazer Maze Challenge, you can either navigate through a web of lasers without touching them or bust through as many lasers as you can, all in a timed atmosphere with the newly re-energized Laser Tag. With four locations throughout Branson, The Track Family Fun Parks can always provide fantastic fun for people of all ages wherever they are located in Branson. And if countless of thrilling rides, games, and more at every location of the Track still isn’t the best ever, don’t miss the Heavy Metal High Rise. It’s a steel and concrete go-kart track that reaches over four stories high at Track 4. This High Rise go-kart track is about 1,200 linear feet long, 700 cubic yards of concrete and 200 tons of steel. Another fantastic ride that you can enjoy at the Track Family Fun Parks is the LumberJack, a multi-level, high-rise wooden go-kart tracks that will give you thrilling ride to a whole new level. This wooden go-kart climbs three stories high with two full spirals and a straight-away climb into a blind peak at Track 5. Built in 2001 with an awesome length of 1,186 ft. it is still the favorite wooden track of many ride enthusiasts today. Lumberjack race track features a smooth wooden surface, 1 blind peak, 2 full spirals, and a logging theme around the track. 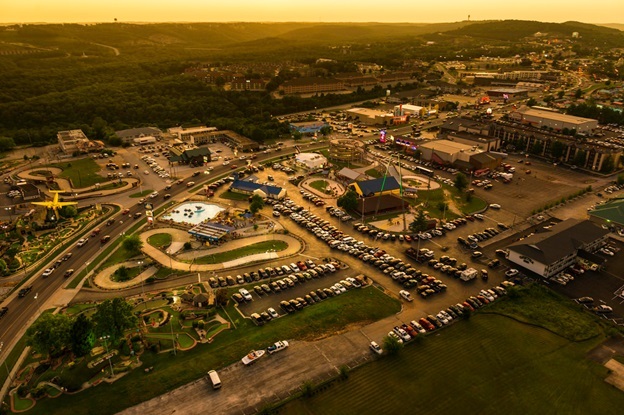 The Track Family Fun Parks is a wonderful Branson attraction which offers tons of thrilling rides that the whole family can enjoy a great time together.